You might know that I am a theater lover, particularly musical theater. While in college I did 3 years of summer theater, participating in a number of musicals. My time playing small roles and being in the chorus taught me an important early lesson in life – I was not talented enough to make a career in musical theater. I saw the leading players, who were trying to make it in NY, struggling, spending their time as waiters, waitresses or doormen. Over the years I have seen many shows, in NY, London, and other major cities, as well as community productions. Needless to say I am a pretty hard critic of theatrical productions – of both the quality of the presentation as well as the content of the play itself. I dismiss a lot of musical theater as “trite,” especially when I can finish the rhymes in songs before I hear them, or when I see the story line as insipid. There are the shows I have seen too many times and never want to see again – like Oklahoma. Yes, I am really picky about the shows I like. In June, however, I saw Hamilton. I am completely obsessed with it! Hamilton might be the most brilliant musical theater production I have ever seen. You see, I gravitate towards shows that bring change to musical theater. For example, in 1957 West Side Story opened on Broadway and brought issues of racism to the forefront of the stage. In 1965 Man of La Mancha presented a play within a play. A Chorus Line gave us an inside look at how theater works based on Michael Bennett’s observations of aspiring dancers auditioning for parts at a workshop. In 1987 Les Miserable eliminated dialogue from the show – creating a Broadway style opera – and used musical themes to subtly connect the story lines of opposite characters. Now there is Hamilton, a show that pushes the boundaries of musical theater to new limits in order to teach us lessons on our history, about who we are, and the true makeup of our nation. In his unique telling of the narrative of Alexander Hamilton’s life, the show’s creator, Lin Manuel Miranda treats the history of the founding of our country with great reverence and respect. Unlike most representations of American history, however, Miranda’s story telling method brings light to aspects of the history, and our nation’s current makeup, that are often overlooked or buried. Too often our history is portrayed in a way that only recognizes a certain group of white, influential figures. 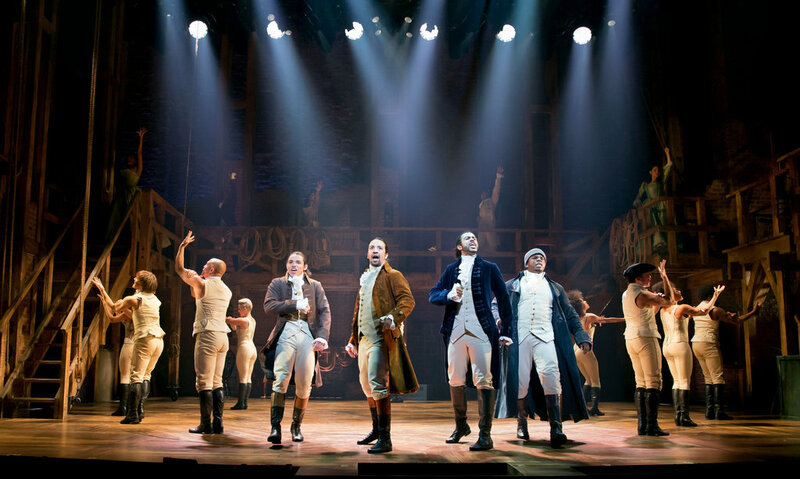 “Hamilton” adds a deeper perspective of our history. How? Well there are two obvious ways. First, his score is a conglomeration of musical styles: hip hop, rock, jazz and classical Broadway – which includes ballads and blues. He uses hip hop to highlight revolutionary activities – not just in the war but to emphasize how our republic was formed and operated. The flow of musical styles from number to number is seamless. This mishmash of musical style acts as a metaphor for the diversity that makes up our country, which can be eye opening yet essential to the way our country is structured and operates. One of the most classical Broadway style numbers is sung by King George, thus representing the “Old World” as opposed to America’s new ways of doing things, which is often presented by hip hop or rap. During some of his musical numbers Miranda tips his hat to prior musicals with lyrical connections to shows, such as “South Pacific,” “1776” and “HMS Pinafore.” These references, just like the varying musical styles are (I believe) meant to show how our country is a sum total of diverse sources, and that all of these sources are a necessary component of who we really are. A second teaching tool is the casting. Three key characters in this story are slave owning Virginians, George Washington, Thomas Jefferson, and James Madison – 3 of our first 4 presidents. All of them are played by African Americans. Indeed, the cast of this show breaks all the boundaries of the old school approach to theatrical casting. The mixture of different races and ethnicities hammers home the lesson that our country was founded for everyone, and its story belongs to everyone, not just an elite group of wealthy white men. Even more, from its very beginning, the show makes sure we understand that it was more than well-known founding fathers who contributed to the strength of our country. For example, during a scene that depicts a cabinet debate over Hamilton’s proposed financial plan, Jefferson states (in a rap style) that Virginia is wealthy, successful and plants seeds, so why should Virginians take on the debt of other states like New York. Hamilton replies (also in rap style) that we know who was actually planting the seeds for Virginians (i.e. slaves) and that Virginians were profitable because of slavery. The message is clear. Not only is slavery wrong (highlighted numerous times in the show), but black slaves were the unseen, unacknowledged resource that provided the platform for Virginians’ (and other southern states) claimed success. The essence, then, of the lessons Hamilton teaches us is this. Through a radical change in the way show is written and cast, we learn about the diversity of our country from its very beginning, and the contributions of all ethnicities to our country. These facts have always been part of our history – just hidden in the standard historical presentations. We are, and have always been, a conglomerate of contributors to the building of our country’s success. Sometimes we resist accepting that fact. Lin Manuel Miranda’s work through Hamilton enhances our perspective on American history. So what does this have to do with us Jews, or Rosh Hashanah? Well, our story is the same. We are made up of varied ethnicities, multiple traditions, and many sources – often from outside the Jewish world. And these outside sources have changed the essence of Judaism, of the Jewish people. Since there is not a Broadway musical to help show these facts, I will share a number of historical examples with you. And please forgive me for not being able to do it in rap style. The first example, however, is connected to a piece of music we all know (sing a verse of Ma Tovu). According to the Torah, these are the words of Balaam, a non Israelite prophet hired by king Balak to curse the Israelites. If you want to read the full story of Balaam and Balak, see Numbers chapters 22 through 24. You will be very amused, especially by Balaam’s talking donkey that I believe was the inspiration for the old TV show, “Mr. Ed.” On the way to curse the Israelites Balaam encounters God, who changes his mission. Instead of cursing the Israelites, Balaam blesses them with the words of Ma Tovu. Who exactly is Balaam? Well, Jewish tradition is very hard on Balaam. One midrash says he was destined to be a prophet to the world, and was of greater intelligence than Moses, but was morally deficient. Another says he was an advisor to Pharaoh in Egypt. The Talmud teaches that his name is a play on the Hebrew words balah am which means “he devoured people.” Yet his characterization in the Torah makes him seem like a decent man – just a bit befuddled. Given the strange episode about Balaam in Numbers, it is easy to think he is just a mythological character. However, inscriptions found on a wall in Deir ‘Alla, an ancient town in Jordan, refer to a real Balaam, who is connected with the God Ishtar. He apparently did good deeds on behalf of the people living in that valley. Why is any of this significant? Because the words of Ma Tovu, which open every Jewish morning service, are attributed to a foreign prophet who archeology shows identified with a non-Israelite god. This, however, is only the beginning of a history of the influence of outside sources on Judaism and Jewish tradition. After the conquest of the Persian province of Judah in roughly 332 BCE, Greek culture greatly affected Jewish tradition, making significant additions and changes to Jewish practice. During the last 2 centuries BCE, Hellenistic culture had made significant inroads into all aspects of Jewish life. In literature, Biblical stories were recast in Greek mode. For example, Joseph’s story from Genesis was retold as “Joseph and Asenath,” in which Joseph was cast as having the powers of a demi-god, such as Hercules. Joseph is described as coming from the sun on a chariot, bringing the suns rays with him. We can thank Greek thought for some key ideas we now identify as Jewish – most significantly the concept of an eternal soul. This opens the door to a real discussion of life after death – what really happens after we die? Is there something that lives on? The oldest parts of the Hebrew Bible give no real description or belief in afterlife, but after adopting the idea of the soul, it permeates Judaism. The rabbinic schools of thought, exemplified by the schools of Hillel and Shammai, are based on the schools of Greek philosophical thought. Further, we see a vestige of Greek influence every Pesach when we have the children search for the afikomen during our seder. Just as there was Jewish pushback against Balaam, there is a long history of Jewish pushback against Greek influence. The Maccabean revolt grew out of a conflict between two groups of Jews: those who wanted to assimilate more into Greek culture and those who saw that assimilation as a threat to Jewish existence and tradition. The Talmud contains much debate on whether Jews should be allowed to study Greek language as well as Greek thought. In the end it is allowed, but not without many objections and arguments. By the 7th century CE, much of the Jewish population had fallen under Islamic rule. The Islamic culture of the middle ages was one of high intellectual and scientific achievement. A group of Moslem thinkers worked hard to mitigate the seeming contradictions between philosophy and science on the one hand, and theology on the other. The exact same exercise happened in the Jewish world, led by theologians such as Saadia ben Yosef and Maimonides. Both Moslem and Jewish thinkers were studying and applying the philosophic works of Plato and Aristotle to their religions. In 9th century Babylon, for example, Saadia ben Yosef used philosophic reasoning to prove creation ex nihilo and to demonstrate the importance of free will in Jewish observance. But the influence of Islam on Judaism is even simpler than philosophical. The kippah or yarmulke that many of us wear does not originate in Torah. Research indicates we adopted wearing head coverings to show subservience to God, from the Moslem culture in Babylonia. It took only a few centuries for this to be so identified as something essentially Jewish that by the middle ages a rabbi was consulted on whether halachah permitted prayer services if the men do not wear a head covering. His response was while it was technically ok, it did not feel appropriate. Even Christianity has influenced the development of modern Judaism. One notable example is the role of the rabbi. Traditionally the rabbi was a teacher, interpreter and judge of law and a community leader. His role was not to lead prayer services, or to provide pastoral care. As Jews became more integrated into Christian communities in Europe and America through the 18th and 19th centuries, rabbis became the Jewish versions of Protestant ministers. There are certainly many factors that contributed to this change, but the change is a fact. You see, change is a reality that we often resist. Change is built into the very structure of the world from the moment it was created – and that is not just a scientific perspective. Every day of creation described in the first chapter of Genesis describes changes God made to the world. The rabbinic explanation for the second chapter of Genesis that retells the creation story differently than the first chapter, is that God recognized the need to change what was originally created, so God changed creation. Change is built into the DNA of the world. Change brought by outsiders who we often see as others or even enemies, is a fact we loathe to accept. Yet that is the reality of life. No person, group, religion, or country can live in isolation from the influences of the rest of the world. It is our personal biases and inhibitions that prevent us from accepting the fact that our nation, our religion, and ourselves are all the result of amazing diversity and interaction with others – often our opposites – who cause change. Yet, that is not the very essence of change. Real change is not just about the changes caused by the nature of the world around us. Real change is about adjusting our perspective, to accept the reality of what the world is – a sea of change – and not be stuck in our preconceived notions guided by our instincts. Real change is about our ability to be open to learning, listening, and even changing our thoughts and beliefs, sometimes in radical ways. And there is a musical play about this. It is Ground Hog Day, a musical based on the movie starring Bill Murray. Do you remember it? Murray is an obnoxious newsman who gets stuck in reliving the same day over and over again. The events of the day do not change, but Murray changes. He becomes a better, more caring person who appreciates the reality of his existence and those around him. That is the essence of change. The facts of the world are there. How do we perceive them? Are we open to them or not? Are we ready to always learn and modify our perspective on those facts or not? Are we open to learning more of them and thus challenge our biases or not? It was the day after the worst day in Abraham’s life. He was thinking hard about a life’s journey that was closing in on 100 years. Leaving his family’s home in Haran – was hard. Trusting that he had properly understood God’s directive to him to travel to Canaan, thus leaving his mother and brothers – was hard; especially since Sarah questioned his motives. Dealing with Sarah’s grief over their infertility was hard. Dealing with Sarah’s jealousy of Hagar after Ishmael was born was hard. Having to expel Hagar and Ishmael from their family’s camp was unbearably hard, but God confirmed Sarah’s wish to Abraham, so he did not question it. Now, here he was, on the day after the worst day in his life. Believing he had once again understood God’s demand, he had taken his son Isaac, to the top of Moriah. Fortunately he left his two young servants at the bottom of the mountain, as he was ashamed to have them witness what he thought God had commanded him to do – to slaughter Isaac as a sacrifice to God. But he did not slaughter Isaac. God sent a messenger at the last minute, literally as Abraham held the knife above Isaac’s neck as he laid shivering with fear on the altar, to stop him, to tell him God knew of Abraham’s loyalty and did not want him to sacrifice his son. A ram appeared and Abraham sacrificed it instead. He felt incredibly relieved. He figured since the incident was over, and Isaac was safe, all of them could go home and continue a normal life. “If that is how you think, I can’t go home with you.” Isaac said in disgust. “But what will I tell your mom if you don’t return with me?” Abraham asked his distraught son. “Then I will tell your mom you went to study God’s word with Shem and Ever,” (1) Abraham replied. So Isaac did not descend Moriah with his father. When Abraham met up with his servants at the bottom of the mountain, they asked where Isaac was. He mumbled something about going off to some school. They did not question him, but they could tell their master was disturbed. In his heart Abraham knew he should go directly home, but he just could not find the nerve to face Sarah. She was way too smart to accept any lie or story about what happened on Moriah. She would be angry that Isaac was not with him. She would be suspicious of any story Abraham told her. Even worse, Abraham knew that on most issues, God affirmed Sarah’s perspective. He did not have the strength to face her recriminations. He realized what a tremendous wrong he had committed to Isaac. Somehow he had misunderstood what God really wanted. And he had wronged Sarah, by not even telling her that he and Isaac were leaving their camp near Hebron, let alone telling her what he had thought God was demanding. He knew the right thing to do was to return home, to Hebron, to pour his heart out in honesty to Sarah. However, he did not have the nerve. So he went to Be’er Sheva. Abraham and his young servants found an inn in Be’er Sheva. The 2 young men with him, who worked mostly as shepards, loved the opportunities there. It was a town filled with entertainment, places to drink and eat, and best of all, gorgeous women, who made themselves readily available. So they enjoyed city life. Abraham, however, barely left his room at the inn except to eat. He sat brooding, trying to figure out how to handle things when he eventually headed home. How could he get Isaac to return. How to make peace with Sarah. Unsurprisingly, each day that Abraham avoided going home to Hebron increased his anxiety. In his heart he knew he was failing by not returning to Sarah, by not talking to her honestly about his mistakes, about his now broken relationship with their son. He confronted the truth that it would be Sarah, not himself, who would be able to sit and speak sense to Isaac. But Abraham was a broken man. For the first time he actually felt the weight of his years, the weight of all he had forced Sarah to experience because of his relationship with this invisible God. Yet, if he would be completely honest with himself, God was telling him to go home, to repair his relationship with Sarah. He just could not. However, Abraham also realized he could not let Sarah sit and wait without hearing from him. So he sent his two young servants. “Go home to Hebron,” he told them. “Tell Sarah I am in Be’er Sheva conducting business, getting some things we need for our herds and household. Assure her all is OK and do not mention that Isaac is not with me.” The two lads then left for Hebron, sad to be leaving the night life of Be’er Sheva, but knowing they had to carry out their master’s demands. Now Abraham was truly alone. He felt agitated. He could not sleep. His mind was tortured by his torn relationship with Isaac. He kept trying to figure out what he would say to Sarah. It was late at night. Abraham could no longer stand the mental torture of being alone in his room, so he began wandering in the streets of Be’er Sheva. This was before the Israelite presence of later years dominated the town, so there were a number of cultic temples throughout the city. Some employed prostitutes. Abraham walked in the night without any awareness of where he was going. He did not know he had strayed into an area of prostitution. A very young woman approached him. “You look lost and lonely sir.” She said. “I can help you feel better. Come with me. You look like you are suffering. Let me ease your pain.” It took a minute or so until Abraham realized she was speaking to him. When he finally looked at her, he saw her as an alluring, beautiful woman, who was beckoning him, inviting him. In his state of mental confusion, Abraham followed her, wordlessly, into the side room of a small cultic temple. There he lay with her and fell asleep. He awoke hours later, his head in her arms. He sat up sharply. “What have I done! ?” he thought disturbingly. He turned and saw the beautiful young woman and the worst of his fears overcame him. “What have I done! ?” he now said aloud. “You have spent the night with me, my lord,” she replied. The disaster of his time in Be’er Sheva now came sharply into focus. He had betrayed Sarah in the worst possible way. Yes, technically Abraham could be with any woman he desired, and marry as many as he wished, but in his heart he knew his treatment of Sarah had fallen to the lowest of the low. He then had a second revelation. If he was truly taking the teachings of his God seriously, then he had also done this young woman wrong. “What is your name?” he asked her. “Keturah,” she replied. “Keturah, a beautiful name. Keturah, please forgive me but I have committed a terrible sin with you. I must and will make this right with you.” “Whatever you pay me will be enough,” Keturah replied. “No,” said Abraham. “That is not how my God says I am to treat a woman that I have been with. I am sorry, I must return to my home near Hebron to be with my family, but I promise this – I will return soon and take you to be my wife. You will live a life of comfort, and I will take care of you.” “As you wish my lord,” answered Keturah. She smiled to herself, knowing that if they did indeed marry, it would be a far better life than she could have ever before imagined. And if they did not, her life would be as it was, a zonah in the service of he idol she worshipped. So finally Abraham headed home to his camp near Hebron. It did not even take him a day. As he rode home on his donkey he worked through in his mind how he would sit and speak honestly to Sarah, how he would tell her the truth about Isaac, what he thought God told him to do, and to deeply apologize for not telling Sarah and for suddenly disappearing from her with Isaac several days earlier. He looked back on his life and realized the burdens he had placed on Sarah each step of the way. He decided to begin by acknowledging to his wife that his decisions had not made her life easy. He realized how deeply he loved Sarah, how much her wisdom, her presence, completed his life. He knew he had to do repentance, to ask her forgiveness. Yes, he was old, but he felt he still had time to try to make things right with Sarah. Abraham was afraid, but now he was also determined. Abraham was trying to be stoic, to present strength in the face of tragedy. But inside, he churned, he grieved, he tried to reconcile the loss of Sarah before having a chance to talk to her, to repent for the wrongs he had slammed upon her. He had no idea how to handle his guilt. What could he possibly do? How could he possibly repent? Sarah was gone and he had to live with that responsibility. Abraham had no idea how to manage his guilt. Sarah was gone. There was no way to ever redeem himself with her. In his mind, life was now a failure. He could only think of two things left he could possibly do. First, he knew that Isaac would not only bear resentment towards him, but would deeply grieve over the loss of his mother. So Abraham had to find a wife for Isaac; someone who was as strong and smart as Sarah; someone who could be Isaac’s rock throughout his life, who would be a source of wisdom. So he sent Eliezer back to Nahor, where, he heard, there were some exceptional women, one of whom might be a great partner for Isaac. Isaac might never forgive Abraham for Moriah, but Abraham knew he had to do something to secure Isaac’s future. I am sure that no one in this room has ever tried to sacrifice a child, at least physically, but perhaps emotionally. I am also sure that every adult in this room has faced a crisis, has had a moment when your actions have created deep pain for your loved ones. I am sure that everyone here has struggled with how to do repentance, has faced fear over having to do teshuvah. How do we handle that moment? I am sure that all of us have had that horrific “day after” our misdeed, in which we churn and grieve over our action. What did we do? Did we hide and delay? That is human nature. Were we honest with ourselves? We know that a delay in confronting the realities of our lives, as hard as that confrontation might be, will only increase and prolong the pain. Yes, we know that. Yet too often we fail to act on that – which is why we need this time of the Yamim Nora’im – the time of Rosh Hashanah and Yom Kippur. For this time of year forces us to confront the reality of who we are, of what to do. If we are serious about trying to correct our paths, to heal the wounds we have caused; we should not only engage in confession and repentance, but we try to find actions that can create a new, more positive direction. We cannot reverse the past. We cannot erase the tragedy we might have caused. All we can do is commit to what is necessary to create a new path. One that builds a better alternative to the path we have tarnished. This is Rosh Hashanah, the beginning of a new year. It is called Yom Hadin, the Day of Judgment. We must judge ourselves. Honestly. We do not have to stay mired in the mud of the past. Abraham could not correct all that happened on Moriah. But he tried to create a new path. The Torah states the following upon Abraham’s death, and I believe it is connected to the path of repentance Abraham chose, “and God blessed, Isaac, his son.” – Genesis 25:11. May we commit to honest self assessment. May we commit to repentance that begins a new, more righteous path. May this bring God’s blessing upon you and yours as well.